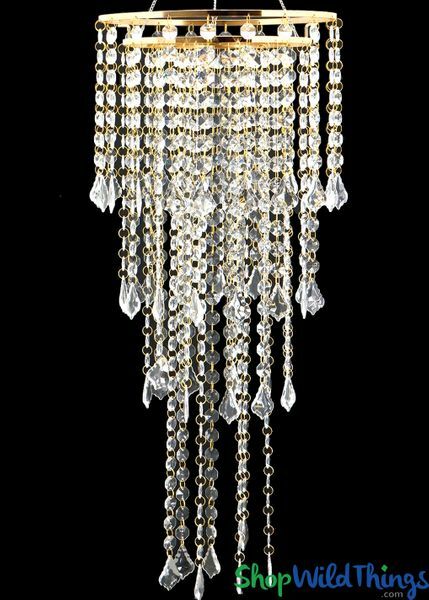 Our spectacular "Bindi" Chandelier features 4 tiers of glistening acrylic crystal beads surrounded by a gorgeous golden frame making this chandelier one very classy accent piece! This round chandelier is 1 foot in diameter and the beaded tiers hang at staggering levels with the longest tier at 27" long. There is a removable 9" chain for a total hanging length of 3 feet. This chandelier weighs 3 lbs. This chandelier can be hung as an awesome glittering decoration or you can use a Light Cord Kit (sold separately) with a standard white or colored bulb. The center of the chandelier already has the hardware needed to hold a light kit in place or use a remote controlled LED Saucer to downlight in white or a multitude of colors. To create focal points around the room that really draw your guests' attention, or to create grand centerpieces, this chandelier gives one elegant performance! Remove the hanging chain (no tools required) and place atop a riser in matching gold or place on a floor standing riser. 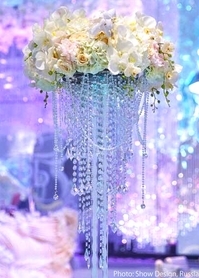 You can either remove the center tier set of beads and depending on the height of the riser, let the beads hang or just let them pool onto the table. This is quite an exquisite look! 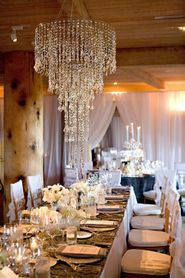 Another option is to pair with our Crystal Beaded Riser Avani which perfectly matches this chandelier. Hanging overhead, dazzling as a floor decoration or gracing an event table from afar, "Bindi" exudes a rich opulence that's beyond standard event decor! 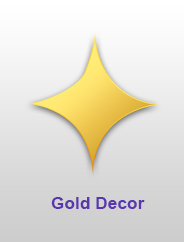 Love the item ,looking forward to using them for an event.